ON THIS DATE (September 20, 2013) ... In a storybook season, the Red Sox reached Destination No. 1 in storybook fashion during tonight's 6-3 win over the Blue Jays. Jon Lester continued his rebound season with his 13th start of at least seven innings while allowing two runs or fewer. The offense used its ultra-patient approach to knock out the starting pitcher before the fifth inning for the 39th time, tied for most in the Majors in 2013. 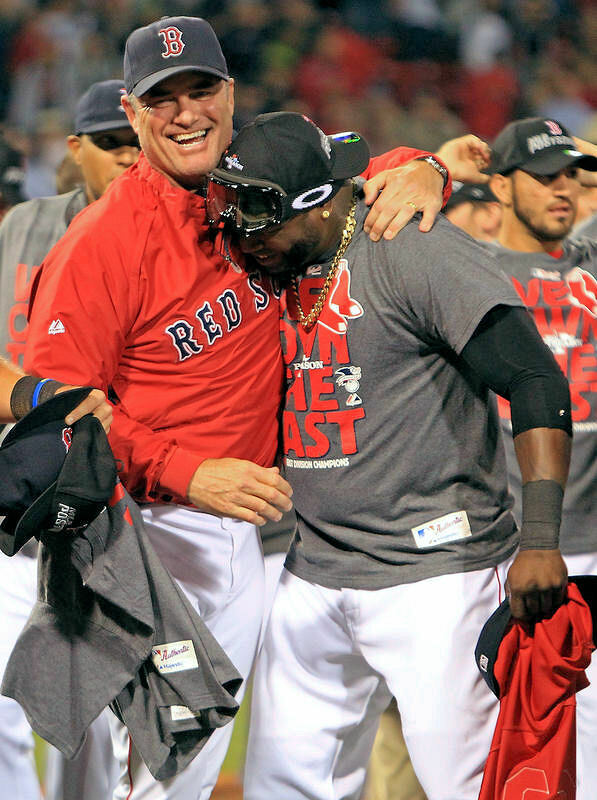 And John Farrell pulled the right strings in the bullpen again, as he became the seventh manager in Red Sox history to lead the team to the playoffs in his first year at the helm. From fifth place to first place, the Red Sox became the second AL team since 1994 to win a division title after occupying the cellar the previous year. With 109 pitches through six, Lester demanded to be sent back to the mound to start the seventh. One, two, three the Jays went. Lester struck out Jose Reyes to an eruption of noise and a standing ovation. It marked his ninth straight quality start. He had a 1.80 ERA in that span. Dustin Pedroia hit a leadoff double that led to him scoring the Red Sox's first run on a wild pitch. In the third it was Daniel Nava who roped his 29th double, this one off the Green Monster, to start the inning. He scored when Mike Carp, who has an OPS more than 300 points higher than the one he posted with the Mariners last year, drew a bases-loaded walk. Back on the attack in the seventh, the Red Sox strung together four straight hits to start the inning. Carp cashed in two on a two-out single and Boston took a 5-1 lead. With the intensity increasing at Fenway Park and not an empty seat to be found, Koji Uehara was called upon for a five-out save. Uehara finished the eighth by striking out Arencibia on three pitches. Then he worked a scoreless ninth yet again. He high-fived and celebrated. For once, the entire team joined him. General manager Ben Cherington sat quietly in the dugout, his hands folded and a "WE OWN THE EAST" T-shirt pulled over his professional attire. Soon after the celebration, the grounds crew was back watering the field. The cans and corks had been disposed of. The sticky tarp was taken down off the lockers and piled on the floor, almost reaching the 101-year-old ceiling. There's baseball to be played.